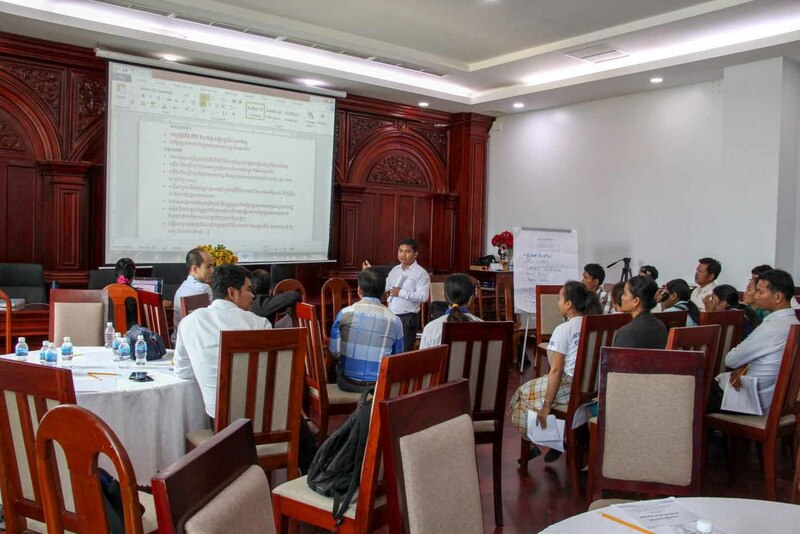 Coordinating by Development Policy Project; the NGOs Environment and Climate Change Alliance (NECA) together projects and networks of The NGO Forum on Cambodia (NGOF) hosted the Two Sub-National Consultation Workshops and Series Meetings on “CSOs’ Inputs for Contribution to the National Strategic Development Plan (NSDP) 2019-2023” at Siem Reap, Kampong Cham Province and Phnom Penh. 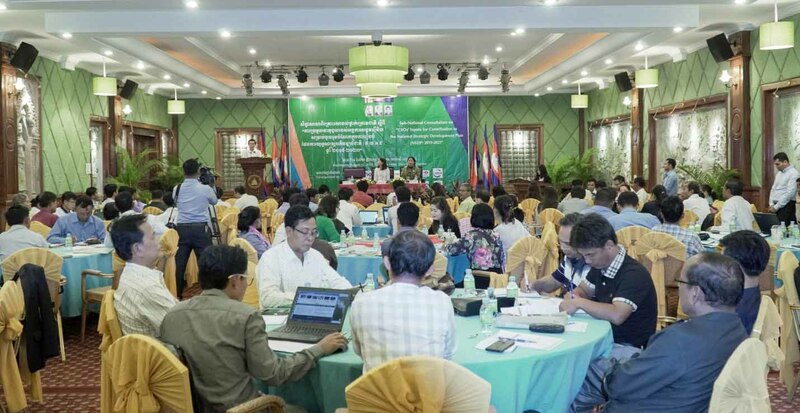 There were 320 participants from representative of civil society organizations, communities, private sectors, academies and media from 22/25 provinces of Cambodia. The purposes of the consultative workshops and meetings were accessed and identified the key challenges and achievement of sectoral-based against indicators set out in the NSDP 2014-2018, and strategic priorities inputs for contribution to next NSDP 2019-2023. Climate Change is real. Climate Change is one of 24 thematic and of 4 sectors of CSO proposing to new NSDP 2019-2023. We are do appreciating to progress of climate change responding both policy development/enforcement and implementation in Cambodia. In such the government response to CC includes a CC Strategic Plan (CCCSP), sectoral Climate Change Action Plans (CCAP), both in 2013, and the Nationally Determined Contribution (NDC) to the Paris Climate Agreement, in 2015. These define a range of priorities that cover most of the sectors affected by Climate Change. Cambodia is highly vulnerable to climate change (CC). Rising temperatures are expected to reduce productivity in agriculture, fisheries and forests and to reduce labour productivity across most sectors. Changing rainfall patterns will lead to increased flooding, drought and storms which will also reduce resource productivity, especially in agriculture and fisheries, and increase damage from extreme events, affecting roads, water supply and other infrastructure. Rising sea levels will cause flooding and storm damage in coastal areas, affecting urban areas and natural resources. Without climate change, Climate Economic Growth Impact Model CEGIM project that real GDP will grow at an average of 6.9% per year from 2017 to 2050 […] Climate change reduces average GDP growth to 6.6% and absolute GDP by 0.4% in 2020, 2.5% in 2030 and 9.8% in 2050 . The National Strategic Development Plan (NSDP) has been developed to serve as the implementation tool or roadmap for the implementation of the Rectangular Strategy for Growth, Employment, Efficiency and Equity – Phase III. The current plan is an update from the previous NSDP (2013-2018). The Royal Government of Cambodia is finalizing its localizing the Sustainable Development Goals (SDGs), creating Cambodia SDGs (CSDGs) 2016-2030. The CSDGs 2016-2030 framework and the sectoral development plans will be mainstreamed into the next NSDP 2019-2023, while the NSDP 2014-2018 is approaching its final target year. The results of Mid-Term Review of NSDP 2014-2018, recognizes an increasingly complex and challenging domestic, regional, and global development environment and Cambodia’s economy is undergoing a significant re-structuring as the sector share of GDP shifts away from agriculture in the direction of industry and services. Furthermore, government and development partner (DP) resources, including civil society, as well as private sector resources, are insufficient to meet all national development objectives. It will be important to more strategically link sector priorities with national development objectives articulated in the Rectangular Strategy (RS) and clarify what aspects of the Plan will be financed by national resources. This will enable government, DPs, and private sectors to more effectively and efficiently coordinate development finance. For the next NSDP 2019-2023 development, the Ministry of Planning will lead the preparation and in cooperation with line ministries (LMs) and line agencies (LAs). The preparation process included (1) the instruction on input preparation, (2) collection inputs form LMs/LAs, (3) draft NSDP 2019-2023, (4) consultation on the draft version with TWGs, LMs/LAs at the technical level and political level, high level meeting, and at the consultation and getting approval by council of ministers’ meetings, (5) the adopted by National Assembly and the Senate and the promulgated by the King for official use. After that, NSDP 2019-2023 will be officially launched and disseminated to all relevant stakeholders at national and sub-national level . In supporting to the recommendation of NSDP review and in relation to the development of new NSDP 2019-2023, civil society plays vital roles in complementing with government, in particularly the support on sectoral development plans. Given the NGO Forum’s mandate through Development Policy Working Group (DPWG) coordinate sectoral NGOs/CSOs monitoring the government’s policies and the implementation of the National Strategic Development Plan, the activity of producing next NSDP 2019-2023 is inherently important. In addition, the existence of NSDP review on NSDP 2014-2018 implementation will be useful for sector NGOs/CSOs in the way that the review findings will be the evidence-based references for supporting sector NGOs/CSOs to monitor the progress and strategic priorities next NSDP 2019-2023.